Another great addition to the on-road track collection: Atsugi 05, an older track lay-out at the Kyosho headquarters in Atsugi, Japan. A small track perfectly suited for all 1:10 and 1:12 racing. Races are planned for this new track starting with 2015 Season 1 Round 5 for 1:12 modified sportscars. Enjoy some very close racing on this track! Austrian VRC World Champion and official Team Xray factory driver Martin Wollanka has won the first round of the short course truck season at Mikes 3. Except for the first 2 laps when he had to settle behind Nicolas Loriot from France who took the wholeshot at the start, Wollanka lead the entire race with a comfortable cusion between him and the hard pressing Loriot, Hofer and Fritschler. Patrick Hofer drove a strong race and looked to be heading for a sure 2nd but a misjudgment on the back straight double cost him even his podium place. Marcin Malinski (Poland) has continued his winning streak with a 3rd straight victory in the fresh 2015 season, after winning the VRC Worlds at Naxos end of December as well. Under perfect dry racing conditions (no rain like during the real GP Montpellier…) Malinski managed to keep the hard charging Uwe de Zwart from Austria who led the first half of this A-main final, behind him. A double crash in lap 24 cost de Zwart a real change on a first Pro class victory. Spanish David Barcena drove a steady race and challenged both Malinski and de Zwart for second place several times but had to settle for 3rd in the end some 13 seconds down on de Zwart. 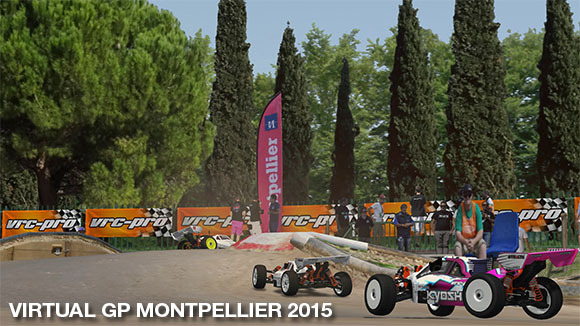 The new Montpellier track has been very well received by the VRC Pro racing community, several racers calling it their new favorite off-road track. The Montpellier track is a typical French track, carved out in the terrain with lots of elevations and tight hairpins. 2014 VRC World champion Marcin Maliński has adde another victory after his very successful Worlds campaign in December. At Psycho Nitro Blast Malinsky dominated the race once more. Martin Wollanka had a bad start and was trying to recuperate from it for the full 20 minutes main final, bit in the end he came about 12 seconds short to be able to fight for a first win in the 2015 season. Markku Honkanen finished 8 seconds down on Wollanka in third position. Check out the video of Anthony's qualifying run. We have added a new outdoor off-road track: circuit MBM - MONTPELLIER – France. This exciting new track was created in close collaboration with the Montpellier club. It’s a typical French style track carved out in the terrain, and VRI’s graphics and 3D artist Tony West has delivered yet another masterpiece by capturing the right atmosphere and character of this track spot on!